Independent Shakespeare Co. partners with Metro Art Moves for a unique way to celebrate love, Shakespeare, and the city of Los Angeles this Valentine’s Day. 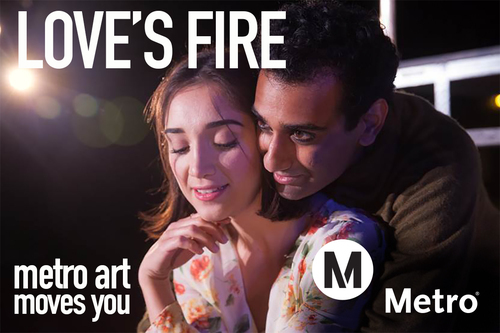 You’re invited to “Go Metro” for a free tour that explores artwork in the Metro system accompanied by scenes from some of Shakespeare’s most famous plays on the topic of love. The 2 ½-hour tour begins at Union Station at 2pm (meet at the information booth in the Alameda Street entrance) and ends at the Hollywood/Western Red Line station. You don’t need a reservation but attendance is limited to the first 50 people so plan to be there early, and make sure you wear comfortable shoes. The Metro Art Moves program regularly offers special tours and other performing arts programming in a wide range of disciplines to enhance and engage Angelenos – everything from music, dance, and poetry readings to films screenings and photography installations. It’s an innovative way to experience art and culture in unexpected places. Who doesn’t love that?! I think I may do this! Thanks for sharing!